Though specialists have devised myriad systems that purport to achieve Inbox Zero, I’m not that ambitious. I just want a system that keeps the number of unread messages in my inbox as small as possible, doesn’t treat my inbox as a to-do list, and doesn’t require me to spend hours sorting and archiving my mail. In addition, a workable system has to be easy to implement: The more complex it becomes, the less likely I am to use it after the first month. It has to be easy to maintain, too: I have enough friction in my workflow without dealing with an email system that requires effort above and beyond standard email practices. And it needs to work across multiple clients: I typically see my messages on my iPad, my iPhone, my Macbook Air, and my Mac Pro—and I frequently access my email through Google Mail’s Web interface, Mail.app, and other third-party applications. I need all of these programs and apps to sync, and whatever system I use must keep things manageable no matter where or how I’m checking my mail. Over the years, I’ve tried numerous systems. Early on, I tried to build a hierarchy of folders that would afford me quick access to email messages relevant to a topic and would keep my inbox empty by consistently filing messages based on their relationship to a project or on their required action. Unfortunately, that tedious approach failed two of my goals: Coming up with the right organizational structure too much time; and filing each incoming message was too laborious. Later, I tried tagging messages, but that operation ran afoul of my third goal: No true tagging system works on every platform. Both Tags and the Mail plugin MailTags use OpenMeta tags, which works well across my Macs. But those tagging systems don’t work on the iPhone or in GMail. GMail’s labels function similarly, but fail in applications like Mail. The system I eventually settled on has been working for me for a couple of years now. It’s a simple plan that involves minimal up-front work; and after you use it for a while, it’s effortless to maintain. It follows the common workflow of filtering, processing, and reviewing email. Only about 20 percent of my email requires any action on my part. So the first step in my system involves automatically filtering out as much irrelevant content as I can. I do most of my filtering at the server level, using GMail’s filters. When I come across an email message of a type that I know I don’t need to see, I create a search using criteria that match it and then I turn that search into a filter. The goal of all of my filters is to move irrelevant email from my Inbox, often marking those messages as read. The email is still there if I search for it, but otherwise I’m not bothered knowing about it. SaneBox reliably separates important email messages from less important ones. I also use a service called SaneBox to automate much of the process. SaneBox is an intelligent system of filters that works with Google and other IMAP services and learns by observing how I deal with my email. It automatically shunts messages that it deems unimportant to me from my inbox to other folders, starting with one named @SaneLater. Messages in this folder remain unread but available for me to deal with later. 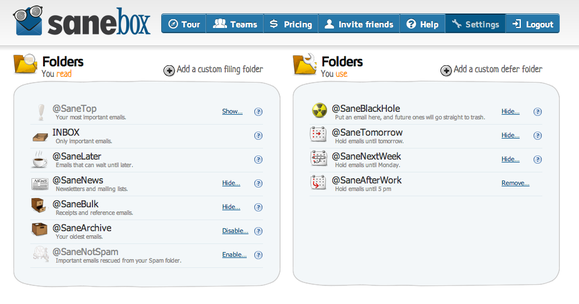 SaneBox also does a smart job of moving bulk and mailing list email messages out of the way. When an email message passes through my filters and shows up unread in my inbox, I deal with it manually. I use Smart Folders (in Mail) and Quick Searches (in GMail) to help with this part of the process. One of the primary folders is a smart one called @INBOX: Notifications and badges on my desktop and laptop focus on this folder instead of on my primary Inbox. That @INBOX folder shows me only unread messages, messages that I’ve placed in a temporary Review folder; and messages that I’ve flagged. Because @INBOX is intelligent, messages disappear from it when I’ve read been read and handled them. A second major Smart Folder folder in my email system is called @LATER. It contains unread messages that got automatically filtered to mailboxes or folders outside my regular Inbox. I can deal with these messages when I have time, but they don’t clog my standard workflow. I’ve made these two folders the first two items in the bookmark bar of Mail—@INBOX first, and @LATER second—so I can access them with a simple keystroke combination (⌘1 for @INBOX, and ⌘2 for @LATER). I separate messages that I want to see into two smart mailboxes in Mail: @INBOX and @LATER. To make this system work with GMail, I use a Google Labs tool called Quick Links to re-create the same Smart Folder criteria that I employ in GMail searches. To access them in GMail, I use the standard shortcut g,l (go to label) and then type @in or @la. I keep one additional folder, called Review, in my IMAP setup. If an email message requires special attention, it gets moved to this folder. On my Mac, the Review folder appears in my Smart Folders and Quick Links, and its contents show up in @INBOX whether I’ve read them or not. When I’m on a mobile device, I simply check this folder directly. I read lots of email while I’m on the go, but I do most of my message processing on my home base’s Mac. But while I’m mobile, I use a few tricks to make the subsequent processing easier. The first of these tricks involves that Review folder I mentioned. If I read a message that I know requires more action than a simple reply or deletion, I move it into the Review folder from whatever mobile device I’m using. As a result, it automatically shows up in my @INBOX back home. Alternatively, I can mark a message as unread (or simply not read it) to leave it in my @INBOX for further processing. I use flags sparingly. I flag items that require a response, and I unflag them when I send the needed response. Flagged items remain in my @INBOX indefinitely, so I make a point of unflagging handled items, to keep my @INBOX clean. SaneBox also gives me the option of forwarding a message to a special email address from which it will return to me later (as determined by the email address). The program also allows me to create special folders for deferring a message until a specified time or day. 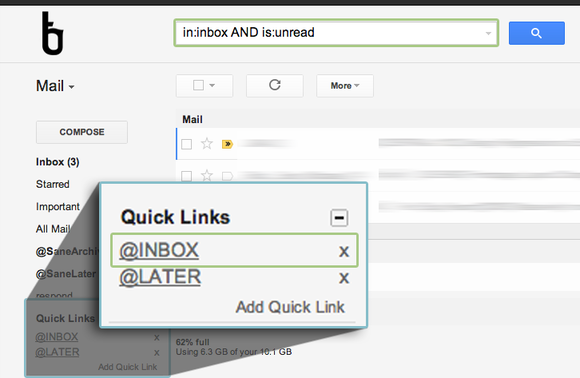 I use Quick Links in Google Mail to navigate easily to my two main mailboxes. Quick response: The quick response category comprises email messages that require a one-off response and no further action (other than action that may arise in connection with a possible reply to my response). I deal with messages in this category immediately, responding in one or two sentences. The original message can then disappear from my @INBOX. If the author of the original message sends a follow-up response that requires action, I deal with the second message as a new item. Thoughtful response: If a message requires something more elaborate than a two-sentence reply, I deal with it when time allows. If I have the time and the reference materials on hand for an appropriate response, I compose it immediately. If not, I assign it a red flag so that it remains in the @INBOX until I respond and unflag it. Action required: Email messages that require action other than an email response don’t belong in my @INBOX. When a message of this type arrives, I use OmniFocus to create an OmniFocus task, with a link back to the original message. This allows me to handle it within a single task-management system that keeps all of my tasks in one place. When I complete the task, I click the link in the note and open the original email message, which is ready to accept my reply if I choose to send one. Informative: Some messages I receive are simply informative. If a message contains material that I may need to consult or cite later, I move the relevant information into my reference system. I use nvALT for this purpose, but you can use whatever your primary “bucket” is (Evernote, Simplenote, or the like). Each note receives a concise, accurate title and has three other components: the body of the information, a link back to the original email, and tags (or a notebook designation) associating it with the right project. Everything else: If an email message doesn’t fall into one of the first four categories, I delete it. If I suspect that I may want to find it again later, I mark it as read and let it fall out of @INBOX. I delete relentlessly, though, and rarely (if ever) have I regretted doing so. A system of this kind depends on regular review of the messages that pass through the filters, of course. But that review is a simple matter of checking @INBOX. Any message that is currently unread, flagged, or parked in the mobile Review folder shows up in @INBOX, and its presence there is a reminder to me that I need to deal with it. A recurring OmniFocus task reminds me to review messages that may be awaiting my attention; but if you use email as much as most people do, you’ll always be aware of what’s sitting there. The goal is to keep @INBOX empty. If mine ever scrolls onto a second page, that’s a sign that I’ve waited too long to deal with things. At that point I ask myself whether each item is something I’ll ever get to. If the answer is “Eventually,” I make a task for it and clear it from @INBOX. If the answer is “Probably not,” I unflag it, mark it as read, and let it float away. Even though my @INBOX is empty, I have a fully searchable archive of every message I haven’t intentionally deleted. My system didn’t require any extra filing, tagging, or additional processing. GMail search is especially fast and accurate. When I need to find a long-gone email, I load up MailPlane or GMail on my iPhone and quickly locate whatever the moment calls for. The result is an empty inbox and true peace of mind. The system is easy to maintain moving forward. The filters take care of half the work, and I can apply the process as time allows. Best of all, I can rest easy at night knowing that I won’t wake up in the morning to hundreds of unread messages clamoring for my attention.